Title page of 1669 edition of Malleus Maleficarum, by Guazzo. Courtesy Fortean Picture Library. The first papal bull directly against witchcraft was that of Alexander IV, launched in 1258. It was followed by a second in 1260. Many more bulls followed by various popes, but none received the attention accorded that of Innocent VIII in 1484. This was not so much for its content but for the fact that, with the advent of printing, Innocent's bull was distributed far and wide, thus having greater effect than any of its predecessors. The bull was then published as an introduction to the Malleus Maleficarum, which appeared in 1486. The Malleus Maleficarum, or "Witches' Hammer," has been described as the most sinister book ever written. It is, in effect, a book of instructions for witch hunters and judges on how to recognize witchcraft, how to test a witch, what tortures may (and should) be applied, what questions to ask, and what answers should be obtained after the torture. It is a terrifying testimony to the nature of the Christian Church at that time. All the tricks for snaring a confession and all the tortures are detailed, including everything deemed necessary to be sure of obtaining a confession, presuming that all those charged with witchcraft were guilty. The book is in three parts, the first of which treats the "three necessary concomitants of witchcraft which are the Devil, a Witch, and the permission of Almighty God." Here the reader is first admonished that it is heresy not to believe in witchcraft. Points are then covered on whether children can be generated by incubi and succubi; witches' copulation with the Devil; whether witches can sway the minds of men to love or hatred; whether witches may work some prestidigitatory illusion so that the male organ appears to be entirely removed from the body; various ways that witches may kill the child conceived in the womb, and so on. The second part, "Treating of the methods by which the works of witchcraft are wrought and directed, and how they may be successfully annulled and dissolved," deals with: the several methods by which Devils, through witches, entice and allure the innocent to the increase of that horrid craft and company; the way whereby a formal pact with evil is made; how they transport from place to place; how witches impede and prevent the power of procreation; how as it were they deprive man of his virile member; how witch midwives commit most horrid crimes when they either kill children or offer them to devils in most accursed wise; how witches injure cattle, raise and stir up hailstorms and tempests and cause lightning to blast both men and beasts. Then follow remedies for all the above. The third part of the book, "Relating to the judicial proceedings in both the ecclesiastical and civil courts against witches and indeed all heretics," is perhaps the most important. It is here that the order of the trial is dealt with. "Who are the fit and proper judges for the trial of witches?" is the first question. It then addresses the "method of initiating the process; the solemn adjuration and re-examination of witnesses; the quality and condition of witnesses; whether mortal enemies may be admitted as witnesses." Here it is said that "the testimony of men of low repute and criminals, and of servants against their masters, is admitted. . . it is to be noted that a witness is not necessarily to be disqualified because of every sort of enmity." In the case of witchcraft, virtually anybody could give evidence, even though in any other case the person would not be admitted. Even the evidence of young children was admissible. This third part continues with such topics as: how the trial is to be proceeded with and continued, whether the witch is to be imprisoned; what is to be done after the arrest; points to be observed by the judge before the formal examination in the place of detention and torture; how she must be questioned; the continuing of the torture; how they are to be shaved on those parts where they use to conceal the Devil's marks and tokens; various means of overcoming their obstinacy in keeping silence and refusal to confess; the trial by red-hot iron; the manner of pronouncing sentence. It is obvious, from the above, that the authors of the Malleus Maleficarum had certain obsessions. A large number of the chapters are, for example, concerned with sexual aspects of witchcraft. But, as Julio Baroja points out, it was not the theologians and scholastic philosophers who were responsible for putting these obsessions into practice. It was the law and the lawyers, both Catholic and Protestant, who made the greatest use of the book from its first appearance in the late fifteenth century through the early eighteenth century. The authors of this infamous book were two Dominican monks named Jakob Sprenger and Heinrich (Institor) Kramer, Chief Inquisitors for Germany. It is on record that Kramer once bribed an old woman to climb into a baker's oven and scream that the Devil had put her there. She was to continue by shouting out the names of witches in the area. Kramer then seized the women named and tortured them until he obtained confessions. 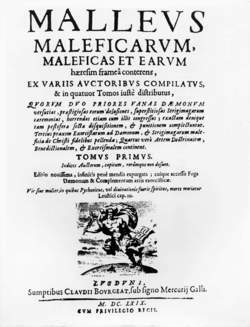 The publication of the Malleus Maleficarum was a signal for the persecutions to start in earnest. As Robbins says, it "opened the floodgates of the inquisitional hysteria." Up until that time, the Church had only made a half-hearted attempt to stamp out the remnants of the Old Religion. But now they started to eradicate every last pagan practice. An interesting sidelight on the authors of the Malleus Maleficarum is recounted by both Gerald Gardner in his Meaning of Witchcraft and H. C. Lea in his Materials toward a Study of Witchcraft. At the time of publication of the Malleus Maleficarum, the appointed Censor of Books was the University of Cologne. When Kramer and Sprenger presented their work, all but four of the professors wanted nothing to do with it. As Gardner says, "nothing daunted, this precious pair of scoundrels proceeded to forge a document which purported to show the approbation of the whole Faculty." Even the four professors who had not rejected it entirely had limited their comments to the fact that there was nothing in the first two parts of the book that was averse to the Catholic teachings, and that the third part of the book must be true because of the character of the various witnesses quoted there. Joseph Hansen, Archivist of Cologne, exposed the forgery in 1898. Apparently copies of the book actually sold in Cologne did not carry the Approbation, although it did appear in copies circulated elsewhere. At Sprenger's death in 1495, although he was a member of the Theological Faculty, he was not given the traditional Requiem Mass by the university.